Our family of multipurpose hardware platforms for safety critical applications. They can be used in test or on-board applications. Orbital CS has its own family of general purpose hardware platforms for rapid prototyping and development of projects in which the safety critical certification is required. NOVA is part of the SBC (Single Board Computer) systems. Thanks to that it can be high performance platform solution. NOVA has been designed under the constrains of the critical application development. Its architecture is based on a modular system, all based on a Zynq-7000 SoC. The SoC has a dual-core processor along with a synthesizable hardware part. This is why you can easily develop and test the interfaces that your application requires. Thanks to the great configuration capability offered by the FPGA, a general purpose system can be obtained with a multiple of possibilities. In the same device we can have a processor in which to run an operating system and have all the peripherals that the application requires. 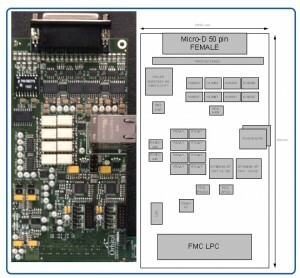 The configurable part of the FPGA offers a space where synthesize all the elements not included in the SoC. The configurable part is programmed using HDL designs to integrate the added functionality required by the system (functions grouped into the IP-Core blocks). For this platform IP-Cores of aeronautical interfaces such us ARINC-429, MIL-STD 155, discrete signal control and RS422/RS485 have been designed. All these IP-Cores are synthesizabled in the Zynq and accessible by the processor via the SoC bus (AMBA AXI). NOVA is compatible with Linux and has been developed a distribution using Yocto Project. The IP-Cores implemented in the FPGA have their specific drivers so it is ready to be use by the application software of the user. NOVA consists in a mainboard where the SoC is located and a series of connected mezzanine boards. With this design you get maximum flexibility, since the core of every application would be the mainboard where the IP-Cores and the software is programmed. The specific physical layers are placed in the extension boards that are connected under demand of the final application. 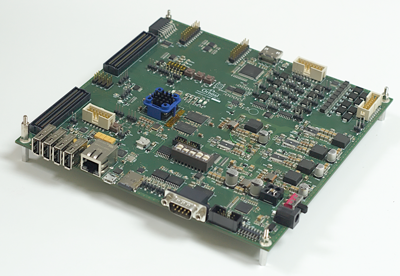 The AMC (Avionics Mezzanine Card) developed by Orbital CS is a board for rapid prototyping in aeronautical applications. The boad has the physical layers of the main interfaces present in these applications: AFDX, MIL-STD1553 and ARINC-429. Additionally we have an web interface that allows you to control and configure the message and interface configuration consequently its use is able from the very beginning.